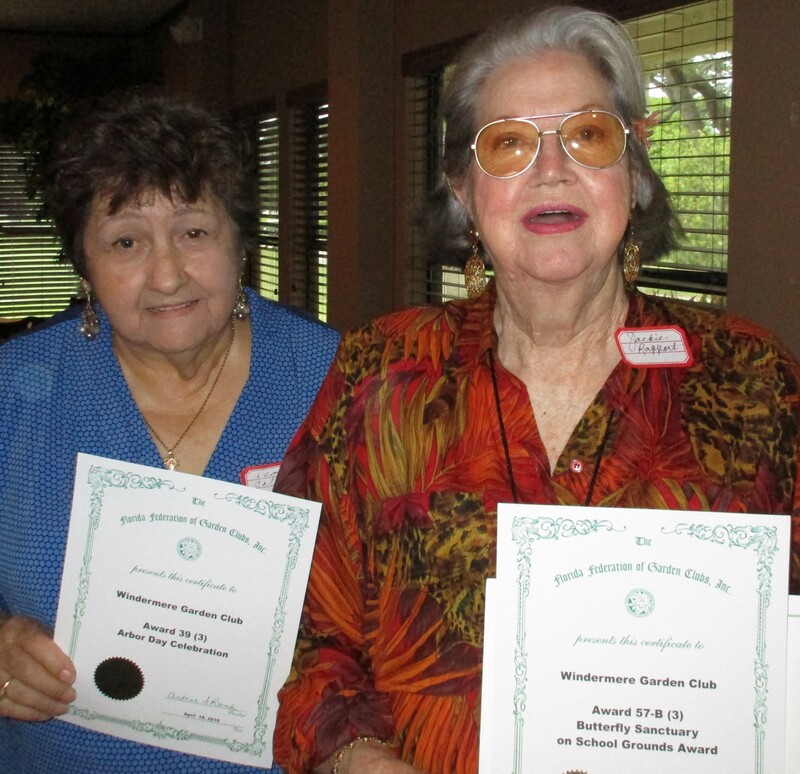 On May 12, 2016, Windermere Garden Club had an officers’ installation luncheon and general meeting at Orange Tree Golf Club. We had a wonderful buffet. 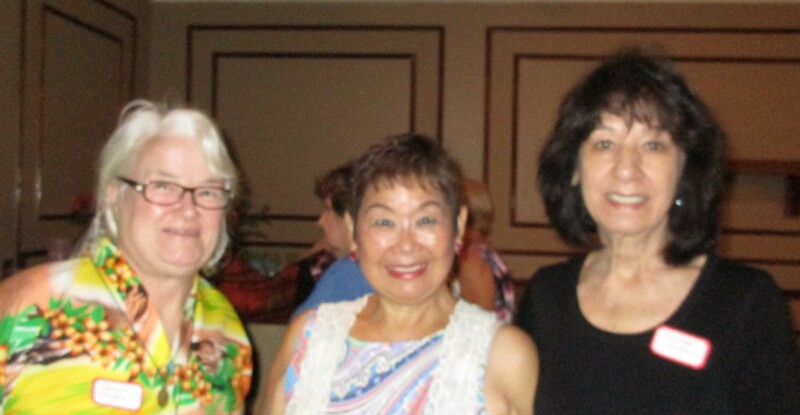 L to R: Denise H., Maria H. & 2nd VP Maureen T.
L to R: Sandra W., Leah D. & Ann T.
President Bonnie B. applied for several Florida Federation of Garden Club (FFGC) 2016 awards and won four of them. They were presented to the current chairman/chairmen of the committees that won an award. Left to right: Vicki H., 1st VP Mary B., Peggy C., Jackie R., & President Bonnie B. with the four awards that our club won at the 2016 FFGC Convention for some of our projects. Butterfly Sanctuary on School Grounds for the Windermere Elementary School Butterfly Garden- Jackie R. & Vicki H.
Left is Corresponding Sec. 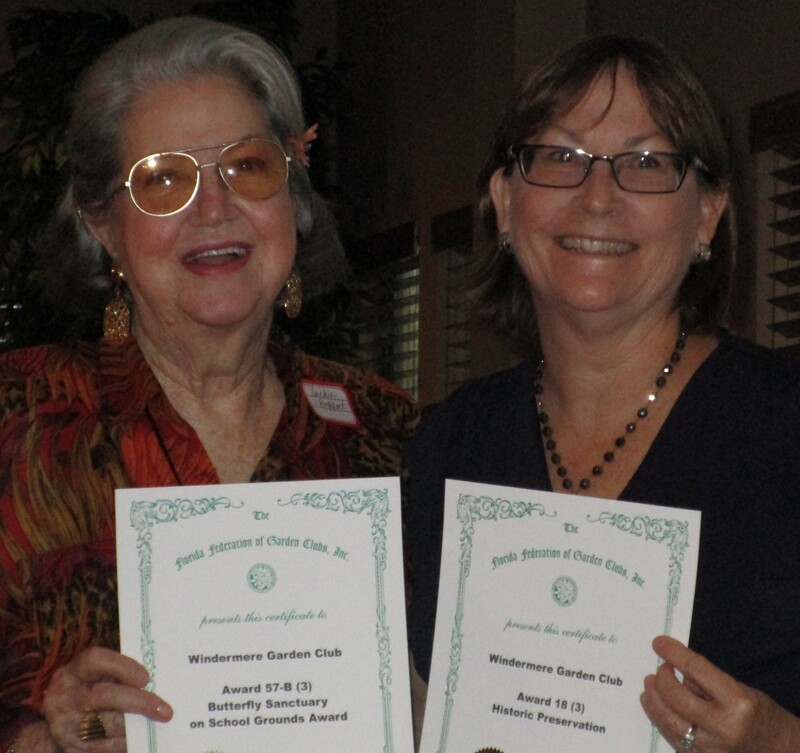 Jackie R. with Butterfly Sanctuary on School Grounds and on right is Vicki H. with Historical Preservation Award. Historic Preservation Award for the Windermere 1887 Schoolhouse Restoration-Landscaping-Jackie R. & Vicki H.
Left Peggy C. with Arbor Day Celebration Award & on right Corresponding Sec. Jackie R. with Butterfly Sanctuary on School Grounds Award. Arbor Day Celebration Award-Peggy C. & Jackie R. This project also won 1st place in National Garden Club’s Deep South Region which includes the states of AL, FL, LA, MS & TN. Also, the installation of the 2016-2017 club officers was conducted by Past President Peggy C. with plants provided by Jackie. All the officers installed were already currently serving. They were President Bonnie B., 1st VP Mary B., 2nd VP Maureen T., Treasurer Mary Ann “Dale” B., Recording Sec. Janet S. (Tanya C. standing in) and Corresponding Sec. 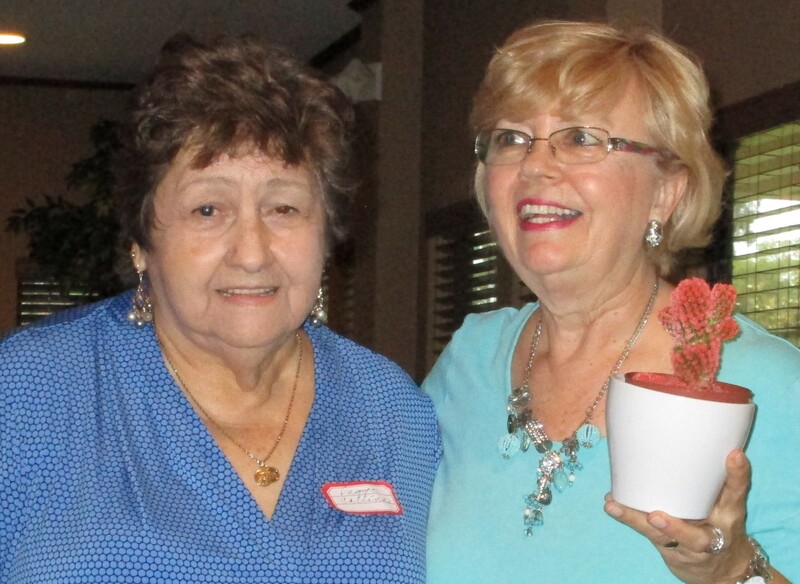 Jackie R.
Past President Peggy C. on the left gives President Bonnie B. a blooming cactus for her past work as president & for agreeing to another term. Our next general meeting will be on Sept. 8th to begin our 2015-2016 club year. Our first summer lunch will be at Crafted, Block and Brew in MetroWest right after the “change over” board meeting on Thursday, June 9th. Contact Paula R. to sign up.